Here are my animal and food trinchies. 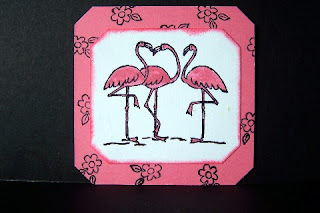 I stamped the flowers for the background. I used the SU ticket punch for the corners. 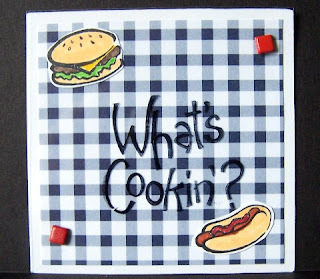 I stamped the "What's Cookin'? onto a transparency. I stamped the hotdog and hamburger and colored them with SU markers, and then I used red brads to attach the transparency to the cardstock. Now I have 8 sets left to create. I'm getting there.